It was a tough year for Per. After ﬁnishing his post-doc and going to a lot of interviews, he ﬁnally got a job at a university on the other side of the country and had just 2 weeks to ﬁnd a new apartment. In the end he managed to ﬁnd one – a really old and dusty apartment. He spent the whole weekend cleaning, throwing away old stuﬀ and repainting the walls. On Sunday evening after 12 hours of work, he couldn’t take it anymore. He just rested on the ﬂoor, covered in paint and dust. The room he just painted was empty, only a lamp was mounted to the ceiling. As he switched it on, he noticed that the light rays coming from the lamp formed a cone and covered some parts of the ﬂoor and walls. All the work exhausted his body, so he couldn’t move, but his mind was still working and wanted to solve some hard problems. He started wondering about the area covered by the light from the lamp. Figure 1: An example of light emitted by a lamp. The room has a horizontal ﬂoor, a horizontal ceiling, and vertical walls. The ﬂoor is a convex polygon. (In the easy data set the polygon is an axes-parallel rectangle.) There is a lamp mounted somewhere on the ceiling of the room. The lamp emits a cone of light downwards. 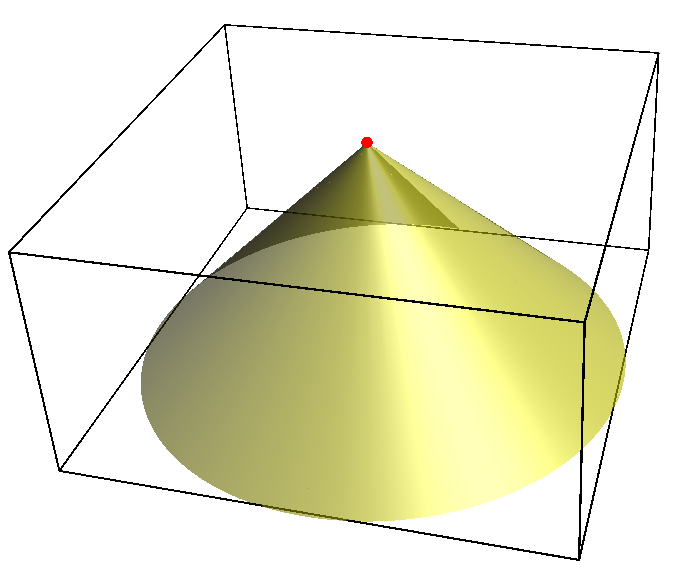 The axis of the cone is vertical. You are given the height of the room, the description of the ﬂoor, the location of the lamp and the angle at the apex of the cone of light emitted by the lamp. The second line of a test case contains the number n of vertices of the ﬂoor. Each of the next n lines contains 2 ﬂoating point numbers xi,yi – the coordinates of the i-th vertex of the ﬂoor. The coordinates are given in counterclockwise order. The z-coordinate of the ﬂoor is 0. In the easy data set in each test case we have n = 4 and the polygon is an axes-parallel rectangle. In the hard data set in each test case we have n ≤ 100 and the polygon is convex. For each test case output one line with one ﬂoating point number – the total area of all surfaces that are directly reached by the light of the lamp. Output at least six decimal places. Solutions with a relative or absolute error at most 10−6 will be accepted.